If you were near TD Garden last fall and looked up about 200 feet, there’s a good chance you saw Heather Daly. She operated the crane above The Hub on Causeway. Heather traded her low-paying office job for the chance to build the city’s skyline and a meaningful career in the union building trades. And while her story is remarkable, it isn’t unique. Thanks to major union-backed initiatives like Build a Life MA, a growing number of women across the commonwealth are helping to drive the region’s building boom. And our efforts are paying off: 93.5 percent of women in construction are getting their start through union-run apprenticeship programs, where they can continue to earn a salary while learning a new trade. The union building trades also provide a pathway to a rewarding career, with industry-leading wages and benefits, free training and skills development, the highest safety standards, and opportunities for advancement. That’s a big reason why when it comes to women working in the trades, Massachusetts is leading the nation. In Massachusetts, the percentage of women in union apprenticeship programs is almost triple the national average of women in the construction workforce. For Heather Daly, having a great, middle-class job with the International Union of Operating Engineers Local 4 has allowed her to buy a home, and to send her daughter to college. It’s also meant finally having the peace of mind that comes with a stable, rewarding career. Thanks to stories like Heather’s, the word is getting out and women are beginning to think about the union trades as an attractive option. Women become construction workers for the same reasons that men do. The union construction trades pay very well, between $60,000 to $100,000 a year, and provide excellent family-sustaining benefits including health care and a dignified retirement. Some women may hesitate to consider the union trades as a career as they may feel they lack the experience. Previous experience is great, but it’s not required. Our programs are specifically designed to train industry newcomers to become skilled craftspeople. Learning is done both on the job and through classroom training. Over the last couple of years, Massachusetts has seen a 107 percent increase in the number of female apprenticeships. Expanding opportunities isn’t just the right thing to do morally — it’s a smart business model. Massachusetts’ building trades and construction contractors have recognized that that there is a tight labor market with an estimated need for more than 43,000 new construction workers. The solution is training and employment for those who have been historically underrepresented, and those who need these good careers now. Industry leaders know that providing a diverse skilled workforce helps grow their market share. The number of tradeswomen across the state has tripled since 2012 and we should be proud of this as it’s a sign of progress. And we’ll continue to create pathways of opportunity so more women like Heather join our ranks. Construction on the 2.9 million-square-foot, multi-building Bulfinch Crossing complex in downtown Boston continues apace this spring. These new photos come courtesy of Iron Workers Local 7 and developer HYM Investment Group. The complex’s first residential tower is expected to stretch to 480 feet and 45 stories, and to include 368 apartments and 55 condos. Construction is supposed to wrap in early 2020. February construction spending was up 1% from January to a seasonally adjusted annual rate of $1.3 trillion, according to the latest report from the U.S. Census Bureau. This most recent spending figure represents a 1.1% increase over the February 2018 number. Combined spending for January and February was just shy of $182 billion, 1.4% more than the first two months of 2018. The level of private construction spending rose 0.2% from January to a seasonally adjusted rate of $994.5 billion, but the nonresidential category fell 0.5% during that same period. Public construction spending increased 3.6% between January and February to a seasonally adjusted annual rate of $325.8 billion. The two public sector categories that saw the biggest month-over-month spending increases were education projects (+0.8%) and highway construction (+9.5%). February’s spending numbers, which followed a January increase of 2.5%, were good news for the construction industry overall, as some economists, according to MarketWatch, had predicted a small decline. This year’s spending so far also represents a bit of a rebound from the relatively weaker spending figures that ended 2018. The Associated General Contractors of America said February’s results match up to what it has been hearing from its members, which is that they have been busy since the beginning of 2019. Contractors said they expect those conditions to continue through the rest of the year. On a year over year basis, the highway-street segment was the real performer, with spending in that category increasing almost 23% year over year. One highway project that will keep some contractors busy this year is the ongoing $2 billion modernization of Interstate 75 in Michigan. The second phase of the program, which runs along an 8-mile stretch near Detroit, will include pavement reconstruction, an upgrade to 18 structures, drainage improvements, noise walls, and high-occupancy vehicle (HOV) lanes, which extend through to the other phases. Phoenix’s South Mountain Freeway Loop 202 is still under construction but is scheduled to be complete by the end of this year, about three years ahead of schedule. The 22-mile project was originally going to be let out in nine separate segments, but the Arizona DOT’s decision to use a public-private partnership (P3) and deliver the entire project in one phase is what is credited with driving the new schedule. According to the Fluor-led Connect 202 Partners, the project has also realized about $100 million of savings and could come in at a total of $1.7 billion. Boston Children’s Hospital is building a pedestrian bridge at the intersection of Longwood Avenue and Blackfan Street, Boston. 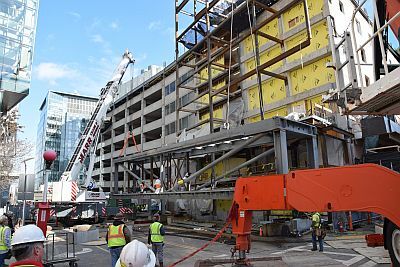 The bridge will provide direct pedestrian access between the Patient and Family Parking Garage and a new lobby above the main hospital’s entrance, making hospital trips safer and more convenient for patients and visitors. Working for steel fabricator Cives Steel and General Contractor Suffolk Construction, Daniel Marr & Son (DM&S) assembled and installed the bridge’s three separate sections over two weekends in November and December 2018. During the first weekend (November 16-18), DM&S installed section one of the bridge, which consisted of 115 tons of steel spanning Longwood Avenue, using Marr Crane & Rigging’s (MC&R) 300-ton Liebherr crane and Hallamore’s 600-ton Terex crane. DM&S spent two weeks preassembling section one on site before it was moved into position on the street via a tandem crane pick and then hoisted into its final position using the 600-ton crane. Due to severe site and time constraints to set the steel in place, significant pre-planning was required to execute this critical lift. The work had to be completed successfully in a limited timeframe, as a portion of Longwood Avenue was temporarily closed, requiring ambulances and other traffic to be rerouted. With 20 ironworkers and four crane operators working in shifts starting Friday at midnight through Sunday afternoon at 4:00 pm, Marr successfully completed the first installation. The second weekend (December 14-16), DM&S was back on site to assemble and install the remaining two sections of the bridge between Friday night and Sunday afternoon. While Longwood Avenue did not shut down for this operation, the hospital entrance did close, thus scheduling the installation with the hospital and the resultant rerouting of traffic were important factors to address. Sections two and three of the bridge girders were set in place by MC&R’s 300-ton Liebherr crane and were assembled at their final elevations while temporarily supported by 14, 100 kip Hi-Lite shoring towers erected by Marr Scaffolding Company (additional shoring was erected under section one for finishing work). Approximately eight precision crane picks were required to complete the installation. A variety of Marr 40-foot boom lifts were on site supporting the installation. Additionally, Marr’s specialty shoring company Isaac Blair assisted with wood dunnage needed to support the bridge on the sidewalk and street. Concrete ballast blocks aided in the temporary bracing of the bridge. By mid-January, DM&S completed all necessary welding and decking on the 250-ton, 250-foot pedestrian bridge connecting the hospital to the parking garage. The bridge is expected to be open for use by next fall. The successful installation of this pedestrian bridge soundly represents the planning and coordination that takes place among Marr’s business units and with a variety of interested parties included in a project such as this. Working diligently with the owner, the neighborhood, Suffolk Construction and others brought about the desired result for Boston Children’s Hospital. Salesforce wasn’t seen as a major player in Boston’s technology scene until the firm hired Lexington native Keith Block in 2013 as president and vice chairman. The company currently has offices in Back Bay, Cambridge and Burlington, but it is looking to boost its profile with a trophy office. The software company is in discussions to move into a planned 690-foot tower over South Station, four sources close to the company’s search for a new Boston office told Bisnow. But those discussions still face development hurdles. The proposed tower’s developer, Houston-based Hines, has spent two years since getting city approval on the project to iron out a deal with parties affected by building an 862K SF mixed-use skyscraper over New England’s busiest train station. The developer needs an agreement with three transportation agencies before it can proceed with construction. When a deal is reached among the various agencies, the developer is expected to quickly get to work on the downtown skyscraper. 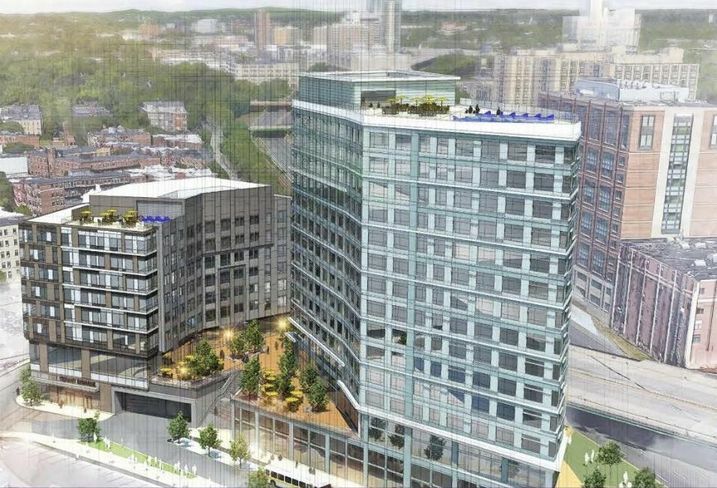 Salesforce is expected to operate from coworking space — multiple sources Bisnow spoke to expect it to be WeWork‘s new 11-story branch at One Lincoln Street — while the South Station tower is under construction. Hines co-owns and co-developed the 1.4M SF Salesforce Tower in San Francisco with Boston Properties and is already planning on building Salesforce Tower Chicago. Both are designed by Pelli Clarke Pelli Architects, the same architecture firm that designed the proposed tower at South Station. Block, now co-CEO of Salesforce, said in a 2016 interview he “wouldn’t rule out” the possibility of a Boston Salesforce Tower given the company’s growth trajectory here. The company’s current Boston office is at 500 Boylston St. in Back Bay. Representatives from Salesforce and Hines declined to comment to Bisnow for this story, and Pelli Clarke Pelli Architects did not return requests for comment in time for publication. It is unclear how big an office Salesforce would have at South Station, but the overall office component of the tower is 641K SF. 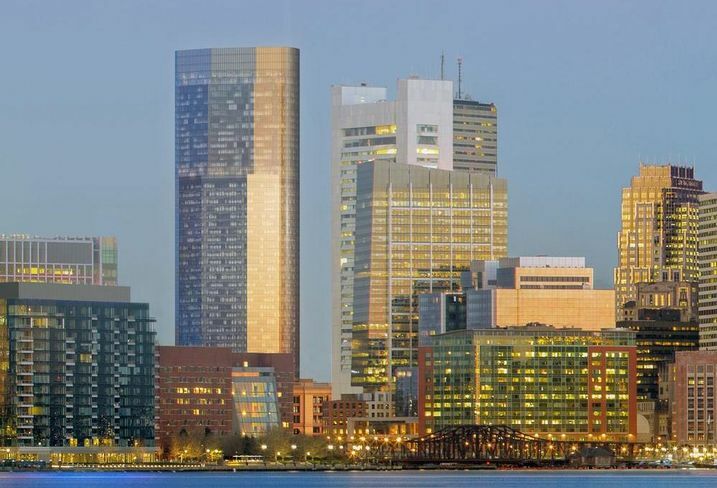 There will also be 166 residential condominiums on the upper floors of the tower, according to approved plans Hines filed with the Boston Planning & Development Agency. The tower would enhance the South Station passenger experience with covered train platforms. Later phases of the site include a 314-foot hotel and/or residential tower and a 229-foot office building in the third phase. Each component of the project will be built over active train tracks, but it is not expected to significantly impact operations at South Station. When complete, the entire South Station mixed-use development will be 2M SF, according to Pelli Clarke Pelli’s website. The South Station tower would join three other downtown skyscrapers in various stages of development, including the 691-foot Winthrop Center, the 528-foot One Congress and the 495-foot office component at Hub on Causeway. 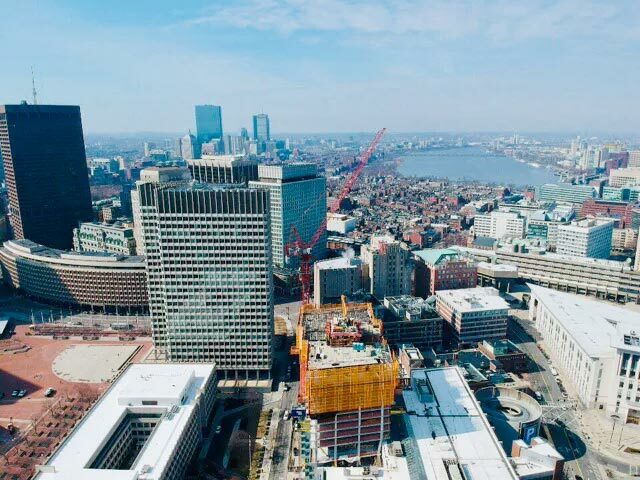 Real estate chatter regarding the South Station tower has heated up in recent weeks, and Pelli Clarke Pelli recently revised the South Station tower section of its website to indicate a 2020 construction start date. Hines had been given a series of extensions to make a deal, which has been delayed in the past over operational cost and capital expense disagreements among the Massachusetts Bay Transit Authority, the Massachusetts Department of Transportation and Amtrak. The current deadline is April 30. “The MBTA continues to work closely with the Hines team and is pleased with the progress that is being made,” MBTA spokesperson Lisa Battiston said. 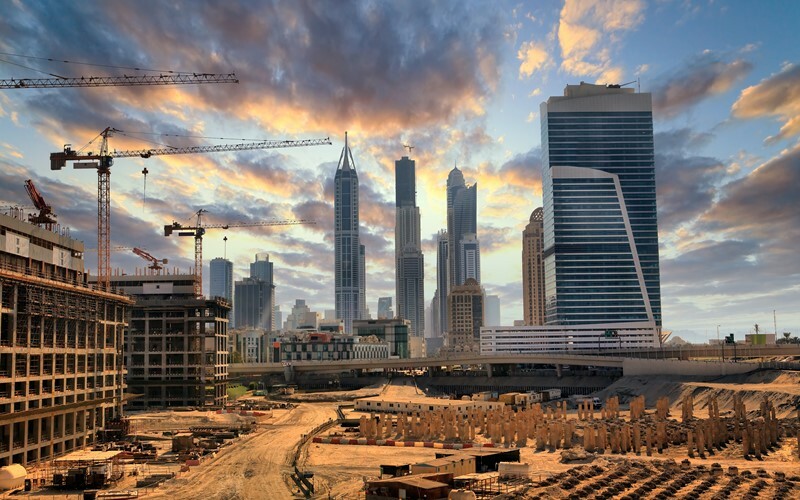 2019 construction spending is expected to continue rising, up 4.8 percent, although at a slower pace than 2018’s 6.5 percent growth, according to Atradius’s annual Market Monitor for the global construction industry. As the U.S. economic expansion slows down, commercial construction growth should decline slightly this year due to higher office vacancies. Residential construction is expected to grow modestly on the back of wage growth, low unemployment and low inventories, while higher interest rates have an adverse effect. Nonresidential construction is projected to continue improving, largely supported by the $305 billion Fixing America’s Surface Transportation Act. Construction businesses’ leverage and dependence on bank financing are generally high, and banks are generally willing to provide loans to the sector. Profit margins are expected to remain stable in 2019, as most businesses can pass on higher commodity costs (also triggered by import tariffs on steel and aluminum) to their customers. Elevated materials costs are expected to persist throughout 2019. Payments in the industry have slowed to 54 days on average, as longer terms have increasingly become a method of attracting business from customers. Payment experience in the construction sector was decent in 2018, and the overall number of payment delays and insolvencies is expected to level off in 2019. Massachusetts General Hospital’s $1 billion expansion in Boston is set to include design features that will allow the hospital to serve as a refuge for staff and patients for as long as four days following a natural or man-made disaster and other emergency events, according to Boston 25 News. Design for the addition is in progress, and architect Joan Saba, a partner at NBBJ, told Boston 25 that her firm is considering every worst-case scenario for the structure, using case studies based on healthcare facilities that functioned during and after 2005’s Hurricane Katrina and 2012’s Superstorm Sandy. 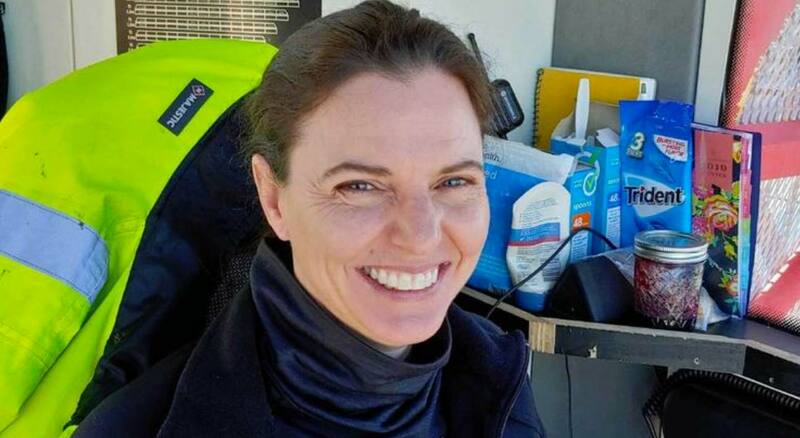 Sally Mason Boemer, senior vice president of administration and finance at Mass General, said the hospital also is flood-proofing existing buildings, a process that includes relocating critical functions to upper floors and using protective coatings on windows and doors. Mass General must still raise the money to pay for the new structure, which will be at least 12 stories and provide 450-plus beds. The building also will feature cancer and heart centers, operating and exam rooms and other patient services. The Partners HealthCare network, which includes Mass General, has been working to institute resiliency measures across its more than 30 facilities, according to Engineering.com. Partners’ Spaulding Rehabilitation Center in Boston was the city’s first waterfront building to be designed to combat the effects of climate change; it was built at 30 inches above the 500-year floodplain and has large granite berms to block floodwaters. It also features redundant HVAC systems, triple-paned glass, extra insulation, light-colored concrete to reflect sunlight and natural ventilation and lighting. It’s important that hospitals continue functioning — even under the bleakest of circumstances — because of the nature of the services they provide, particularly if there is a chance of a high-injury rate in the aftermath of a man-made or natural disaster. The 1994 Northridge earthquake in California did an estimated $3 billion in damage to hospitals, so the state enacted legislation that established seismic requirements for healthcare facilities and also requires certain hospitals to upgrade, some by 2020 and others by 2030, depending on their level of structural performance. But the construction upgrade requirements, especially for smaller hospitals in rural areas of the state, have been financially burdensome for some facility owners. A merger with a larger system, according to The Bakersfield Californian, is the only way that some of these cash-strapped healthcare providers can afford to make the necessary renovations, as well as critical investments in new technology. Japan Airlines began nonstop flights to Tokyo in 2012 and has since been joined by other foreign carriers Cathay Pacific, to Hong Kong, El Al, to Tel Aviv, and LATAM to São Paulo. Emirates, which already offers nonstop service to Dubai, will begin utilizing the A380 — the world’s largest passenger airliner — at Logan, which rebuilt a portion of Terminal E to accommodate the plane. “If you’re an internationally minded company, Boston is a significantly better fit than it would have been 10 years ago,” Stewart said. Royal Air Maroc was also recently approved to begin flying between Boston and Casablanca, Morocco — Logan’s first destination on the African continent — later this year. Massport, which oversees Logan, has taken note and is essentially rebuilding the airport with a nod toward all its success. A 400K SF addition to Terminal E will deliver seven new international gates in a building meant to be a “new city icon,” according to notes from a January Massport briefing session. Terminals B and C are getting significant makeovers, including a post-security connector to improve passenger flow between the two terminals. The terminal optimization plan is meant to accommodate growth on the international front as well as domestic additions from JetBlue, Logan’s largest airline tenant, and Delta. Further down the line, a $1.5B automatic people-mover running to each of the terminals, parking and rental car facilities and the on-site MBTA Blue Line station are meant to push passengers away from their cars and onto public transportation. The Ted Williams Tunnel to the airport was added as part of the Big Dig to relieve congestion in the Sumner and Callahan Tunnels. The addition of a highway exit in the Seaport made that neighborhood what Stewart calls Boston’s “de facto airport office park,” as it is a 10-minute drive from Logan. Companies like Reebok, GE and Amazon have flocked to the Seaport, citing its access to the airport as a key component in deciding to sign a lease. But Logan’s ability to attract big business has also made tunnel traffic a routine part of the trek to Logan. Massport, which didn’t respond to Bisnow‘s request for comment for this story, has indicated in meetings it is taking congestion seriously. In exchange for approval to add more parking at the airport, Massport will pay for eight new Silver Line buses to carry passengers between Logan and South Station. The agency is also looking to boost ridership on water taxis to the airport, expand Logan Express service to the suburbs and even limit curbside drop-offs to high-occupancy vehicles. Considering the airport has added 10 million passengers in the last five years, continuing to maximize efficiencies will be critical to maintain growth, both at the airport and for the businesses it helps Boston attract. 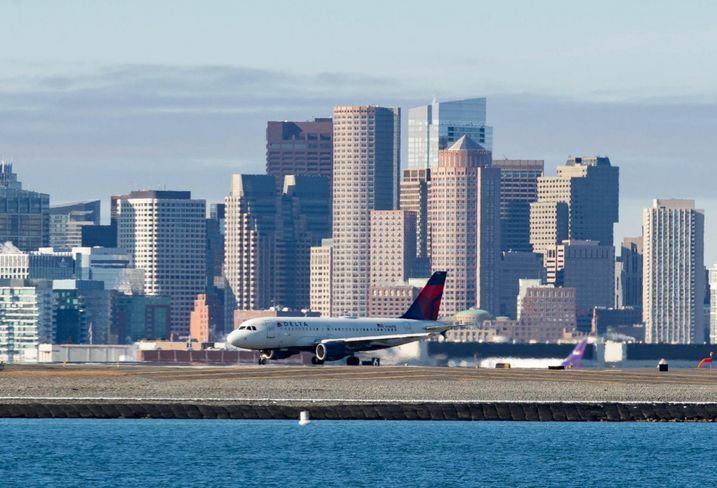 The airport handled 40.9 million passengers in 2018, according to Massport, placing the airport ahead of legacy airline hubs like Philadelphia International Airport and Minneapolis-St. Paul International Airport. While those airports are dominated by one large airline, Boston hosts smaller “focus city” operations like JetBlue and Delta Air Lines. Those, along with the airport’s other airlines, handle more origination and destination passengers as opposed to flyers just connecting through en route to a different city. But the airport has grown exponentially since 2010, with JetBlue and Delta competing for business traffic and international carriers finding success on long-haul routes with more efficient and modern aircraft. Gates are hard to come by, and arriving to the airport is becoming just as much of a headache as it was before the Big Dig, which made Logan more accessible to downtown Boston and the Seaport. Passenger boardings at Logan grew by 41% between 2010 and 2017, growth eclipsed only by Seattle-Tacoma International Airport and Fort Lauderdale International Airport, according to Stewart’s latest MassBenchmarks report on Logan’s role in the Boston economy. International traffic has been the biggest growth segment at the airport. It represented just over 13% of overall Logan passenger traffic in 2010, and grew to 18.6% of overall traffic in 2018. The growth has led to Boston’s international reach moving beyond 30 destinations in 2010 to 55 at the end of 2018. 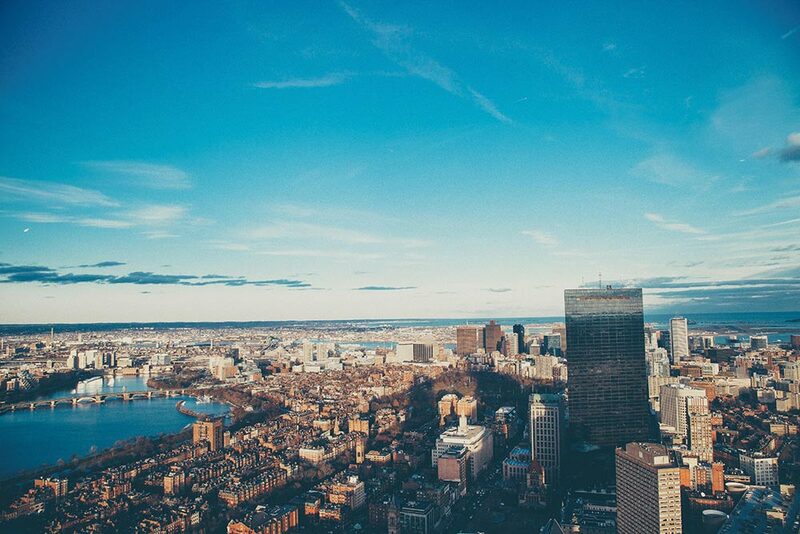 Boston developers continue to enjoy a building boom in New England’s largest city, but some wouldn’t mind a downturn to help with the region’s notoriously high building costs. “The biggest help to bringing down costs will be a market correction,” Gerding Edlen Director Matt Edlen said. “There are many out there who can’t wait for that to happen. It’s a weird thing for a developer to say.” Owning a home in Boston isn’t cheap, and developers have stressed that comes from high building costs. A typical one-bedroom unit in Boston costs developers roughly $450K to build, and that translates into higher rents for residents. “The cost burden requires you to underwrite a staggeringly high rent,” said Edlen, who is speaking at Bisnow’s Boston Construction & Development event Jan. 24. “It’s hard for really anyone to underwrite anything that is a little more market-friendly.” While a market correction would play a significant role in bringing construction costs down, other factors will also help. Negotiations with building trades, prefabricated building materials and political pushes for more units of housing are among the alternative solutions Edlen said will play a part in making Boston more affordable to live and develop. Gerding Edlen is behind Boston multifamily projects like The Troy in the South End and The Eddy on the East Boston waterfront. Its latest project, the Fenway Center, is its most ambitious: Its second phase calls for decking over the Massachusetts Turnpike near Fenway Park and erecting a 27-story mixed-use tower over the busy highway in the project’s second phase. The $240M first phase currently under construction is slated to deliver 312 apartments, 37K SF of retail and a 12K SF air rights deck over Yawkey Station sometime in 2020. There are several air rights proposals currently floating over the Mass. Pike, but the last air rights project that was successfully completed was Copley Place in the 1970s. The financing and logistical burden has left many projects on the drawing room floor. Decking over rail yards and industrial space in Widett Circle, once touted as the future home of a Boston Olympic stadium, was estimated to cost $1B. Gerding Edlen, which is developing the Fenway Center in a partnership with Meredith Management and TH Real Estate, is working with Massachusetts officials and the Massachusetts Department of Transportation to figure out a model for all air rights projects and how to share the cost burden on decking. “What we have done is not look at this as a one-off deal,” Edlen said. “How do we simplify the process so when you get to the real heart of deals like this, we’re all on the same page?” While a downturn would help with building costs, Edlen and other local developers don’t expect Boston to feel much pain in the market correction many economists expect sometime soon. Cranes dot the sky from the Seaport to the South End and over to Cambridge. HYM Investment Group is on track to deliver the 423-unit residential tower at Bulfinch Crossing in Government Center in 18 months, according to HYM Vice President John Hurley. The developer, with partners National Real Estate Advisors and Carr Properties, will also begin the 1M SF One Congress office tower at Bulfinch Crossing this summer. Since 1961 we have been the top provider of Hot Galvanized Anchor Bolts, Rods, Studs, Nuts, Washers, Screws, Fasteners and 1000s of products. Allied Bolt & Screw can fulfill any building and manufacturing need. Contact Us for more information. As required by the state Constitution, Governor Charlie Baker filed his recommendations for the FY20 budget on January 23. The budget contains $42.7 billion in gross spending, a 1.5% increase over projected FY19 spending, and anticipates a deposit of $297 million into the Stabilization Fund, for a projected balance of $2.8 billion. The FY20 budget assumes a reduction in the income tax rate to 5% on January 1, 2020, which according to the Governor’s budget message will return $88 million to taxpayers during the fiscal year. In addition to the budget proposal, the Baker-Polito Administration filed legislation to launch a major new climate change adaptation initiative, funded through a modest increase in the deeds excise paid on real estate transactions. This investment will amount to $75 million in FY20, and $137 million on an annualized basis to support the Commonwealth’s communities in upgrading their infrastructure and planning for the impacts of climate change. The measure, which is a similar concept to what UCANE proposed before for the Clean Water Trust, would allow for resiliency spending on water infrastructure, among other priorities. Of additional note to UCANE members, the Governor’s budget recommended an increase of $5.5 million to the Massachusetts Department of Public Utilities to support and enhance the pipeline safety division’s critical testing, investigations, and oversight responsibilities to ensure that natural gas distribution companies are in compliance with safety regulations. Further, the Governor level-funded the contract assistance line-item for the Clean Water Trust’s use to the previous appropriation of slightly over $63 million. Through a supplemental budget, approved by the legislature and signed by the Governor, this important line item saw a one-time $10 million increase last fiscal year. The decrease for the Clean Water Trust was expected, but since last year’s advocacy was effective, there could be an opportunity to increase funding once again. The Governor’s budget level-funded the appropriation for the Underground Storage Tank reimbursement program, which was temporarily increased last year by $20 million to reduce the backlog on existing claims, to $8 million. Finally, there were two outside sections that may be of interest to UCANE, including a technical change in the definitions of “supplier diversity programs” now run by MassDOT and a water/school deleading initiative that appears to allow for the use of revolving funds for school deleading programs. The Massachusetts House of Representatives will take up its proposed FY20 budget in April, while the Senate will consider its version in May. A conference committee of three Representatives and three Senators will then resolve differences in the two proposals by reporting a final version for the Governor’s approval, ideally, before July 1. The new Massachusetts Department of Family and Medical Leave (DFML) has announced a series of listening sessions to solicit feedback on the proposed regulations governing this new program. Responsible for operating the estimated $800 million paid family and medical leave program, DFML will run the program with funding from a small payroll tax beginning on July 1. The new law calls for up to 12 weeks of job-protected paid leave to care for a seriously ill or injured family member, to care for a new child, or to meet family needs arising from a family member’s active duty military service. It also authorizes up to 20 weeks of job-protected paid leave to recover from a worker’s own serious illness or injury, or to care for a seriously ill or injured service member. Benefits will become available on January 1, 2021 for workers seeking time off to bond with a new child, take care of a sick or injured service member or to tend to a serious personal health condition. On July 1, 2021, benefits will be made available for workers to care for a family member with a serious health condition. The leave benefits are to be funded through employer contributions to a new trust. The contribution rate is 0.63 percent on the first $128,400 of a worker’s annual earnings and employers can require that employees contribute up to 40 percent of their total medical leave contribution and up to 100 percent of their total family leave contribution. In an end of January press release from his office, Massachusetts Executive Office of Energy and Environmental Affairs (EEA) Secretary Matthew Beaton announced that Matthew Nelson has been appointed Chairman of the Department of Public Utilities. Nelson replaces outgoing Chairman Angela M. O’Connor, who departs following a four-year term. According to the release, under Chairman O’Connor’s leadership, the Department of Public Utilities addressed important matters including the modernization of the electric grid, the passing of utility federal tax savings back to ratepayers, the compensation of owners of new solar projects, and the strengthening of consumer protections for competitive electric supply sales. Additionally, during Chairman O’Connor’s tenure, the Department implemented one of the most comprehensive ride-for-hire laws in the country in an effort to prioritize public safety and thorough background checks. Mr. Nelson assumes the role of Chairman having worked for the Department for eight years, most recently as the Director of Electric Power and Regional and Federal Affairs where he played key roles in overseeing investments in grid modernization, general rate case issues, renewable energy development, climate strategies, competitive supply, and management of storm restoration issues. During his time in state service, Mr. Nelson has also played an instrumental role in developing comprehensive energy legislation that requires state utilities to solicit long-term contracts for 1,200 megawatts of hydropower and 1,600 megawatts of offshore wind energy. Prior to public service, Mr. Nelson spent four years at Eversource Energy as the Supervisor of Regulatory, Policy, and Planning as part of the MassSave Initiative – a nationally recognized public policy initiative that has succeeded in helping the Commonwealth achieve its environmental goals, as well as reduce costs for Massachusetts ratepayers, and those across New England. A graduate of Stonehill College, Mr. Nelson holds a Master’s degree in economics from Tufts University. At the end of January, the Baker-Polito Administration awarded five grants totaling $315,901 to help six communities and water suppliers with water conservation, source and demand management, and other water withdrawal planning and mitigation projects across the Commonwealth. The funding will be utilized in the communities of Auburn, Danvers, Norfolk, Plymouth, Westford, and Littleton. The grants are part of the Water Management Act (WMA) Grant Program, an effort by the EEA and the Massachusetts Department of Environmental Protection (MassDEP) to maintain clean rivers and streams and improve degraded water resources over time. The WMA Grant Program helps water suppliers by providing grants for watershed planning projects, demand management, and minimization and mitigation activities for water withdrawal impacts. Auburn Water District: Permanent Interconnection with Worcester – Design and Permitting Phase 2 – $84,400. Town of Danvers: Drought Management and Minimization Planning – $74,888. Town of Norfolk: Integrating Water Smart Planning and Practices – $25,000. Town of Plymouth: Supply Evaluation and Water Conservation – $53,544. Westford and Littleton: Stonybrook Restoration Project – $78,069. The WMA Grant Program helps guide water management in the Commonwealth for both the long-term water needs of communities and the protection of the aquatic ecosystems. The program is funded through the Massachusetts Five-Year Capital Plan, and requires a 20 percent match from the communities involved. University of Massachusetts, Lowell (UMass Lowell) researchers are developing ways to improve the durability and longevity of New England’s roads, bridges, and tunnels as part of a new initiative supported by the U.S. Department of Transportation (USDOT). Funded by $14 million from the USDOT, the Transportation Infrastructure Durability Center (TIDC) will bring together researchers and students from universities across New England to advance solutions that improve the region’s infrastructure. The center will tackle problems such as the toll New England’s winter weather takes on roadways, bridges, and tunnels. The salt used to de-ice road surfaces further damages foundations and pavements and corrodes steel structures, creating costly problems for motorists, cities and states. Prof. Tzuyang Yu, Associate Professor in the Department of Civil and Environmental Engineering, is leading UMass Lowell’s research team, which includes Civil and Environmental Engineering Prof. Susan Faraji, Electrical and Computer Engineering Professor Xingwei Wang, Assistant Professor of Mechanical Engineering Zhu Mao and Plastics Engineering Professor Ramaswamy Nagarajan. UMass Lowell students participating in the project include Ruben Diaz, a civil engineering major from Dunstable, and Ph.D. candidates Ahmed Al-Zeyadi of Quincy, Cong Du of Dracut and Sanjana Vinayaka of Lowell. One out of every five miles of highway pavement in the nation is in poor condition and the roads have a significant and increasing backlog of rehabilitation needs, according to a 2017 study by the American Society of Civil Engineers (ASCE). The researchers hope improvements to the civil infrastructure will result in lower maintenance costs, as well as enhanced safety, fewer traffic delays and accidents, and reduced fuel consumption and carbon emissions. Professor Yu is already researching innovations that could contribute to the success of the new center. Last year, Professor Wu, Professor Wang and UMass Lowell Civil Engineering Professor Pradeep Kurup, along with researchers from Saint-Gobain Corp. in Northborough, were awarded $853,000 in funding by the Advanced Functional Fabrics of America (AFFOA) to create textiles integrated with optical fibers and sensors. These next-generation fabrics are to be applied to structures such as pipelines and bridges to detect strain or cracks in their early stages, minimizing repair costs, environmental impacts and disruptions to people’s lives and businesses. Along with UMass Lowell, partners in the new TIDC include the University of Maine, the University of Connecticut, the University of Vermont, the University of Rhode Island, and Western New England University.